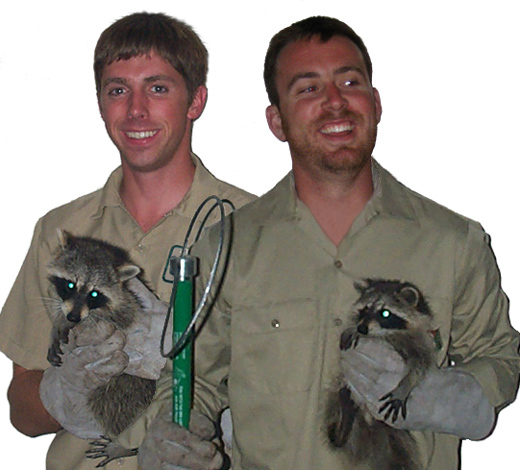 About Us - Information about Our Polk County Florida wildlife removal experts. Armadillos and opossums can be a nightmare when they start to uproot your lawn and dig under your home, porch, or shed. These animals like to burrow under our property to build nests for their babies. If you are finding holes near your home and you think you may have a Lakeland wildlife issue, please feel free to give us a call. We answer our phones 24/7 to better service you! Our team proudly service the following cities: Auburndale, Davenport, Eagle Lake, Fort Meade, Frostproof, Lake Alfred, Lakeland, Lake Wales, Mulberry, Polk City, Dundee, Hillcrest Heights, Lake Hamilton, Winter Haven, Plant City, Haines City, and Bartow. We also service the following counties: Lake County, Osceola County, Okeechobee County, Highlands County, Hardee County, Manatee County, Hillsborough County, Sumter County, and Pasco County. The nine banded armadillo, which is the only kind of armadillo that includes the United States in its range, is a very interesting animal. Armadillo is a Spanish word for “little armored one “ and there are 20 varieties of armadillos that live in Latin America. Armadillos have bony plates that it's cover the back, head, legs and tail of these odd looking creatures. Armadillos are the only living mammals that wear such shells. Armadillos are most closely related to anteaters and sloths. The nine banded armadillo is a mainly nocturnal, solitary animal found in habitats from Canada down into South America. It is classed as an insectivore, which means it feeds mainly on insects but it has been known to eat other small invertebrates. It has one unique talent in that it can jump straight up for about 3 to 4 feet but it will only do this if really badly frightened, which as you can imagine makes it a particular danger to motorists. Armadillos have been expanding their range very fast since the 19th century mostly with the help of human beings, humans introduced armadillos to Florida in the late 19th century and soon afterwards the animal was not only spreading north through Texas but North and West from Florida as well. The main reason for this rapid spread in the United States is at the animal has virtually no natural predators in the US so there is absolutely nothing to stop the expansion continuing. The proliferation of these animals in some places has led to some states like South Carolina thinking about introducing a hunting season for armadillos, in South America even though they have natural predators nine banded armadillos since the 19th century have expanded their range from Brazil down through Uruguay and into Argentina. Nine banded armadillo's, the most highly prolific of the 20 types of armadillos, weigh weight in up to 14 pounds though the largest specimen ever caught weighed 22 pounds, they are up to 2 feet long with a tail up to 20 inches long. They stand up to 10 inches tall at the top of the shell. The shell is made of the same material as claws, hair and human fingernails, keratin. Armadillos are extensive burrowers, they burrow for their food, and they burrowed to make a place to live, burrowing is also used as a defense when they are attacked, they quickly dig a shallow burrow and lodge themselves inside it, the predator is then faced with dealing only with the armadillos armor. To learn more about our services, visit the Lakeland wildlife removal home page.